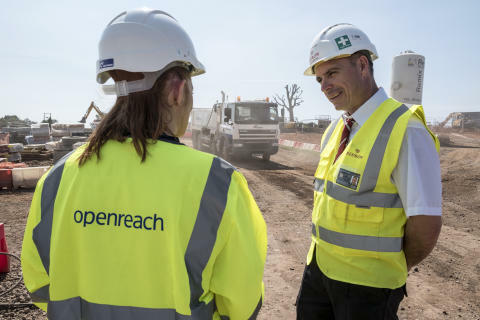 Scores of homes in the Black Country are set to see their broadband speeds soar thanks to a new partnership between housebuilder Redrow Homes and Openreach, Britain’s digital network business. Around 150 properties at Redrow’s development in Throne Road, Rowley Regis, will be gaining access to superfast broadband with speeds up to 80Mbps – which is more than double the UK average broadband speed – where previously their typical speeds were less than 2Mbps. The co-funded deal, which will see Openreach investing alongside Redrow Homes, will include around 3,000 premises on housing developments across England and Wales bringing fibre broadband to the first tranche of residents by early October next year. Redrow Homes CEO John Tutte, said: “When these homes in Throne Road were first planned – they were not within the scope of any commercial or government investment plans for fibre broadband. We saw the potential of a national co-funding agreement with Openreach for homes we’d previously built that had lower than average broadband speeds. We wanted to improve our customers’ experience in homes that don’t have the benefit of full fibre technology. Kim Mears, managing director of infrastructure delivery at Openreach, added: “I’m delighted to see customers in Rowley Regis benefitting from this initiative, some of whom have struggled with lower than average speeds in the past. The success of this agreement shows the power of working together in partnership to find a solution to make high-speed broadband available for these customers. All future Redrow homes will benefit from full fibre FTTP technology delivering ultrafast speed as standard, but homes in Throne Road, Rowley Regis, were built before Fibre-to-the-Premises (FTTP) technology was widely available free of charge to developers. Openreach now has an agreement in place with the UK Government and the Home Builders Federation to provide ultrafast fibre broadband infrastructure free of charge to all new housing developments of 30 properties or more. Across the Black Country and Birmingham this has already benefitted nearly 1,900 homes and flats in places like Bilston, Dudley, Kings Norton, Selly Oak, West Bromwich, as well as in Birmingham city centre. Or you can contact the Openreach PR team at press@openreach.co.uk. Ashdown Vale in Bognor Regis, West Sussex.